If you like munching on cartilage, neurotransmitters or grey wrinkly matter then you’ll really enjoy Buca Restaurant. 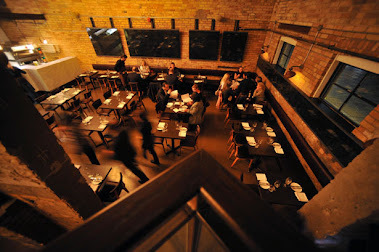 Located in the heart of downtown Toronto, this has become the dernier cris with food critics, visiting celebs, public figures and just the everyday foodie. Elitist and sublimely pretentious, I felt the establishment tries a little too hard to be avant garde. Analyzing the menu, I decided that the pig’s ears and the lamb brain could be a desperate attempt to be different. I think the last people I knew to venture toward this genre of cuisine were my grandparents and that was only during the rations of WW11! My hubby and I went to this well-acclaimed restaurant believing we were going have a fine dining experience. 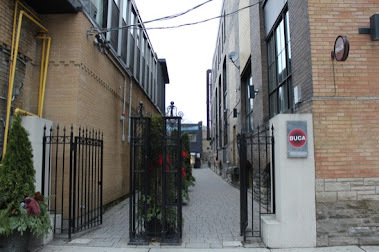 That’s what they advertise – “Buca, a fine dining Italian restaurant”. Although prices correspond to the definition of “fine dining”, Buca’s website oddly lists the average price point at $30. Contrary to the website information, the average plate of pasta (which should be one of the cheapest items on the menu) has a ticket value of just slightly less than $30. Also inconsistent with this number are the desserts that are in the $25 price range. A slight contradiction, n’est pas? Our server was a very nice young man who gave a thorough explanation of the menu and catered to our every need. He explained that all ingredients were fresh and that many of the organic staples are brought in from local farms. I like killing two birds with one stone…supporting the local economy as well as ingesting as little toxins as possible. I was impressed. As we sipped on our San Pellegrino (we had just come from a wine tasting) we could hear our neighbour gorging on his pizza at the next table, which was only inches away. Tony ordered the Eggplant Parmigiana. It was the size of a brownie. Not pleasant for a big guy. Chewing dispassionately in this tasteless cube, he seemed bemused. I on the other hand, began to sink my fork into the Gnocchi di Zucca e Ricotta (potato dumplings alla Pumpkin and Ricotta cheese). 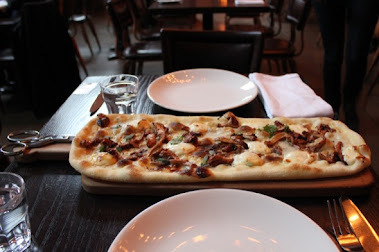 I had this savoury dish just recently at a northern Italian piazza and was craving it once again. Sadly, I was not to have a similar experience. Au contraire! My poor little gnocchi (all ten of them) were swimming…or should I say drowning...in cream sauce. They lacked the deep rich flavour of pumpkin and smokey ricotta. I was so disappointed but couldn’t tell Tony for fear the other patrons would hear my lament. 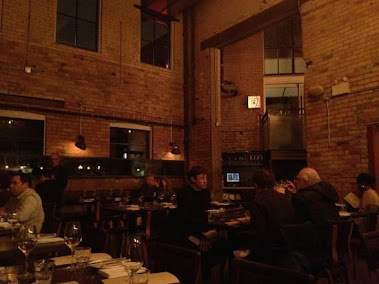 Although, esthetically pleasing with high, brick ceilings and a contemporary - eclectic flair, the close proximity of the tables in this restaurant put a huge wrench in the ambience. This was a dismal denouement after our exceptional wine tasting at the Shangri-La Hotel. I was looking forward to dining at Buca because of all the hype. Although Buca is a clean, elegant establishment with accessible parking and great service, I personally would not recommend it. The food lacks flavour and the portions are so small that I left hungry. Shouldn’t eating out be all about food…food….food?!! Out of five stars I would only give Buca a two and a half. Why so low? The restaurant loses an entire star for not offering a complimentary basket of bread. Only Focaccia is available and you're charged for it! I've dined in some pretty high-end Italian restaurants frequented by aristocracy and public figures. This wealthy patronage was never taken advantage of as the bread was always on-the-house. Final thoughts? After spending $150 on a tiny square of parmigiana, twenty gnocchi (Tony ordered this dish as well), one bottle of sparkling water and two lattes along with another $25 on parking, I felt like I’d been cheated.